All companies know that it is important to understand the market and what drives client satisfaction. This is why the customer insight industry is booming. Firms invest in their customer insight management to better understand their customer experience and increase profitability. However, aside from client interactions, there is another key factor driving company efficiency and cost: employee satisfaction. Employee insight – understanding what drives employee satisfaction – is vital to maximizing profit. 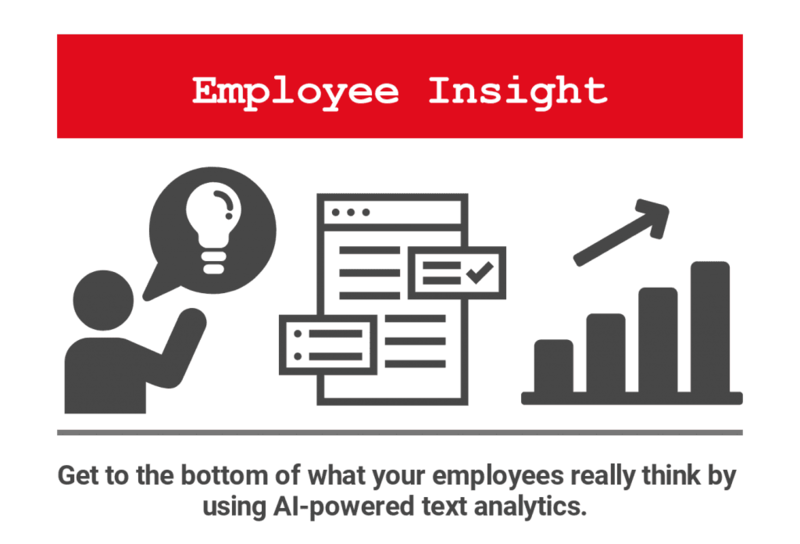 Why is Employee Insight important? High levels of job satisfaction within a work environment yield a whole range of benefits: higher productivity, increased employee engagement, higher employee retention and lower HR costs. All of these aspects have a direct impact on a company’s bottom line. The obvious way to discover what is important for your own employees is to collect feedback, usually in the form of periodical surveys. It costs time and money to carry out employee surveys, so it is important that the results are analysed thoroughly and that decisions can be taken to subsequently taken to improve the profitability of the business. Otherwise, such surveys are just ticking an HR box and are a waste of time. How does Gavagai handle Employee Insight? The deepest insight to be gained is from free text responses. Anyone who has ever completed a numerical survey (“On a scale of one to five, how do you feel about X?”) will testify that the responses to such questions are far from well considered. On the other hand, given an opportunity to answer an open-ended question, the respondent is much more likely to express a nuanced opinion or bring up a topic of particular importance to them. Up until now, these free text answers have been difficult to analyse. This is no longer the case. Built specifically for the analysis of unstructured text, the Gavagai Explorer is the only tool on the market powerful enough to gain actionable insights from your textual data. Our technology applies state-of-the-art techniques from text analytics and text mining to perform qualitative-to-quantitative data analysis of textual data. Upload your data and get a customizable analysis of the most prominent topics in your data. Sentiment analysis is performed both on a document level and topic level. This gives insight, not only into the job satisfaction of individual employees, but into what is driving satisfaction surrounding particular aspects of the employee experience. The insights from our the Explorer have allowed world-leading Human Resources managers to gain vital knowledge about what powers employee satisfaction across their business. As the solution is scalable, it works equally well for large multinationals with many thousands of reviews and for smaller enterprises. Gavagai lets you analyze employee experience, employee feedback, employee engagement and employee satisfaction in Azerbaijani, Albanian, Arabic, Bengali, Bulgarian, Catalan, Chinese, Croatian, Czech, Danish, Dutch, English, Estonian, Farsi, Finnish, French, German, Greek, Hebrew, Hindi, Hungarian, Icelandic, Indonesian, Italian, Japanese, Javanese, Korean, Latvian, Lithuanian, Malay, Norwegian, Polish, Portuguese, Romanian, Russian, Slovak, Slovenian, Spanish, Swahili, Swedish, Tagalog, Thai, Turkish, Ukrainian, Urdu, and Vietnamese.